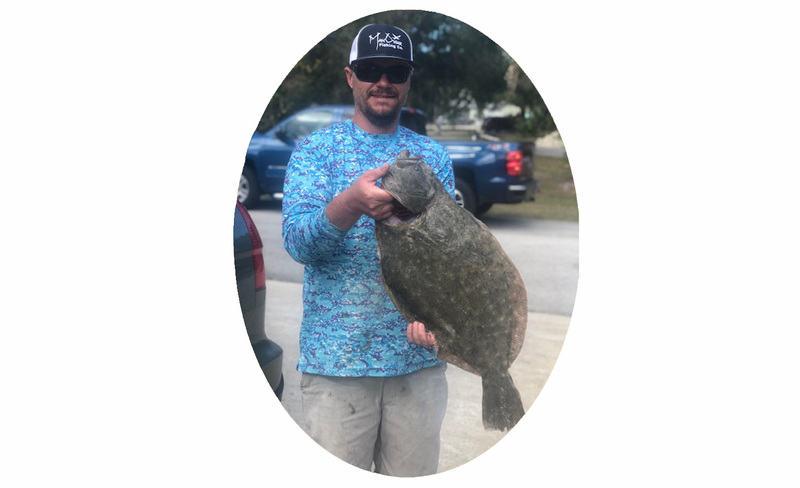 In the St. Lucie and Indian Rivers anglers working the bridges are catching black drum and croaker using shrimp on a jig head or shrimp on bottom rigs. That same set up is also producing a good bite on Spanish mackerel and bluefish in the rivers. Along the beaches in the Jupiter area there has been good action on pompano. They’ve been hitting on Doc’s Goofy Jigs, clams and Fishbites. Be advised that there is a beach renourishment project in progress on Jupiter Island. This is creating some cloudy water and can make fishing for pompano in that area difficult as the fish can’t see the baits. Head north or south of that zone for the best fishing. In the Loxahatchee River, there have some pompano, some black drum and a few sheepshead being caught. There have also been good numbers of ladyfish. Though not big, they are still a blast to catch. They’re being caught on live shrimp and jigs in the main body of the river where it’s a little deeper. Snook season opens on Friday. If targeting these prized fish best bets are to work the areas around bridge pilings as the water temperature will be warmer. Also, whether using artificial or live baits work them much slower than normal as the fish are not nearly as aggressive in the cooler water. Remember slot size is 28 to 32 inches and it’s one fish per angler per day. Anglers at the Boynton Inlet have reported catching croaker, sheepshead and mangrove snapper using live shrimp, blanched sand fleas and live crabs. It’s been slow fishing in the Intracoastal Waterway and around the Lantana Bridge with the cold weather. A few jacks, sheepshead and pompano were caught under the bridge on Monday using blanched sand fleas and cut shrimp. Though it has been cold the bass fishing has been pretty good. Using live bait, anglers working the outside grass lines in clear water have having a blast. 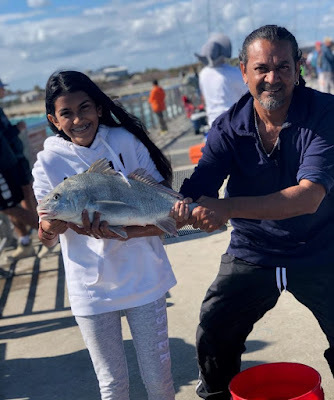 Check out one of our favorite photos submitted and our featured angler of the week – Sabita – with a really good looking Black Drum she caught off the North Jetty with her dad. 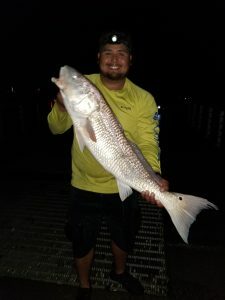 Our friend Tommy at Sebastian Inlet Bait & Tackle has seen a number of massive Redfish, with Snook, Sheepshead and Blues biting too off the North and South jetties. A few Black Drums as well, and a few days ago, one angler caught a nice Spotted Trout off the seawall by the north catwalk. Flair jigs are working great for the oversized Reds during the day and at night, use them for Snook. Spoons are also working well for mainly Blues and Reds. Best live bait options are shrimp and sand fleas, with the sand fleas proving especially good for Sheepshead. Seems that our die-hard anglers have been out fishing because of the weather, but more moderate temps and clear skies are expected this week so get out there! This Fishing Bait will Stab You, but it's Worth it! The Fish is Bigger than Him - Boy Fishing for Giants! Talked with our friend Tommy at Sebastian Inlet Bait & Tackle this morning. The weather has been chilly, but glorious. During the super wolf blood moon last night with cool temps, live shrimp were running on the outgoing tide. Tommy saw a 40 lb. 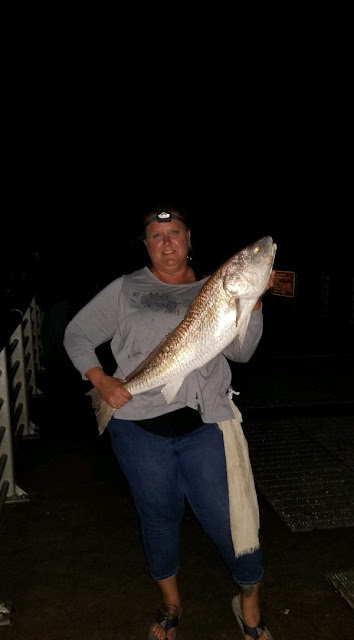 Cubera Snapper caught out on the North Jetty and weighed a 20 lb. Black Drum for one of the jetty anglers yesterday. Fishing has been great with lots of Snook, Reds, Bluefish and Spanish Mackerel. Live shrimp and sandfleas have been working best as bait. Days can be windy and cool, but overall it has been beautiful on the water. Water temps are in the mid 60's lately and that usually means deeper water for better results. As the day warms up, you can fish shallower water when the fish move up onto the grass flats. Expect those weekly cold fronts to move through the Treasure Coast and keep the water cooler this month. Winter is a short time for us and spring will be here soon. Look for trout to be on the grass flats as the water warms up in three to five feet of water. Our redfish have been hanging under docks along with drum, sheepshead and snapper. 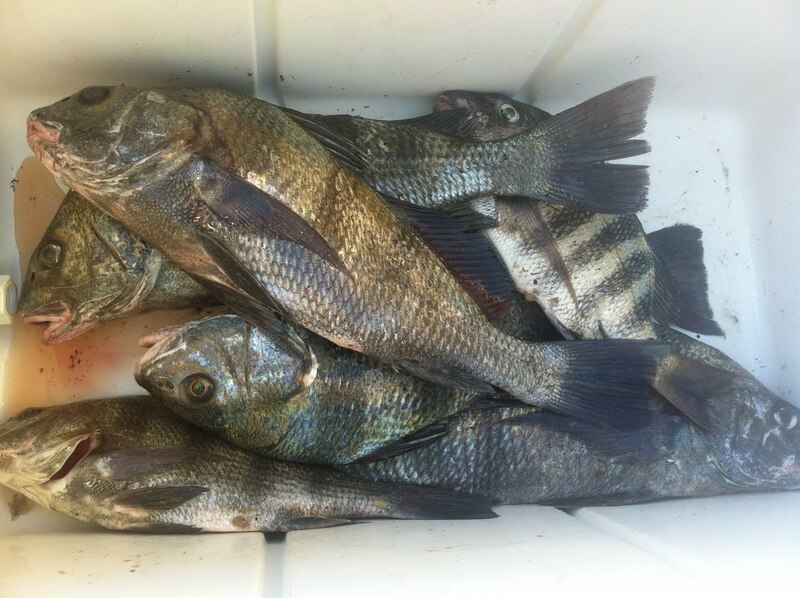 Channel edges and bridges have been good for snapper, sheepshead and drum. Mackerel, jacks and ladyfish have been coming in with the tides. In the St. Lucie and Indian Rivers the sheepshead are thick. Really thick. Along the channel edges, markers, docks, bridges and pretty much any structure there are “more than you can shake a stick at” as one guide put it. They are being taken mostly using shrimp on a jighead. In addition to sheepshead, that particular bait combination is also working well for black drum, redfish, croaker and two more seasonal fish: swordspine snook and fat snook. 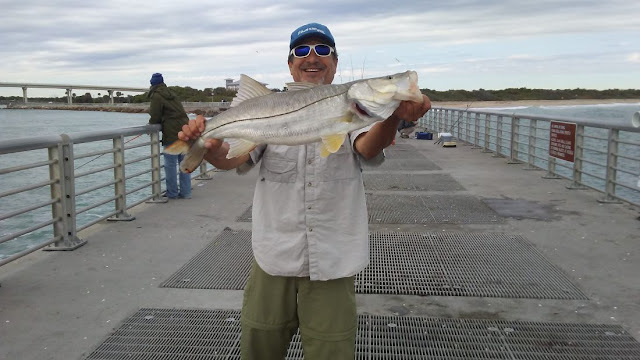 Though the swordspine and fat snook are smaller subspecies of snook and never reach ‘keeper length’ they are fantastic fighters and fun to catch. They are also being caught on small live baits including pilchards. There has been a good pompano bite from the Juno Pier down to MacArthur Beach State Park. In the Lake Worth Inlet, anglers are having a blast catching hard-fighting jack crevalle. Even not catching them, they are putting on quite a show tearing through schools of ballyhoo. 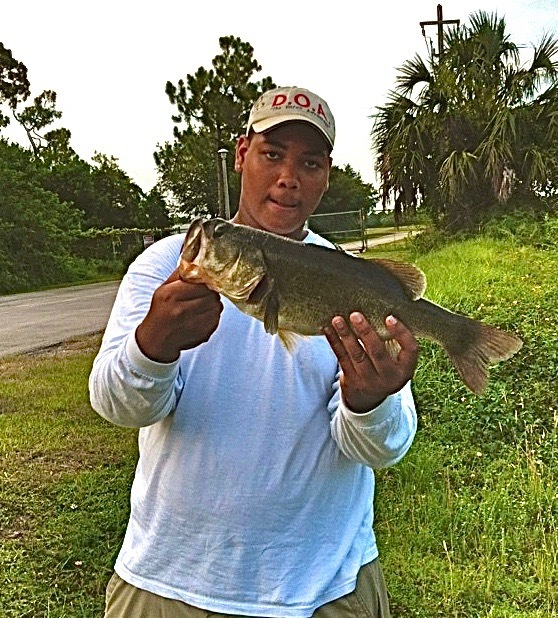 The bass bite has been good lately on both live shiners and artificial baits. For artificial, flippin’ and pitchin’ have been producing as well as some top-water plugs. If you can locate where they’re bedding down, Senkos have been working. The spec bite has been picking up at night, but it’s been a bit scattered. They’re being caught using minnows in deeper water in the Kissimmee River as well as with jigs in shallow water. If going with a jig in shallow water try chartreuse or white if it’s sunny out or go with a darker color if it’s cloudy. Some guides think this year’s big run on them could be a bit later that usual. The recent cooler weather has helped boost the black crappie bite. Anglers using jigs tipped with live minnows and grass shrimp are having good luck working the thick weed cover adjacent to deeper water. 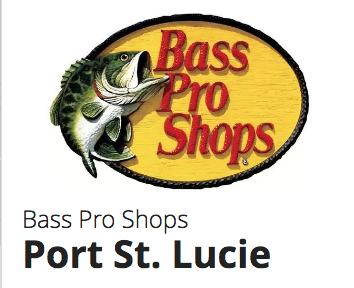 The Seminar season is here and after receiving a phone call yesterday it appears I will be doing a Pompano Seminar at the Port St Lucie Bass Pro Shop next Saturday, the 19th. I will confirm the exact time later today and be sure to post it. The tentative time is 3:30 PM and the admission is free. 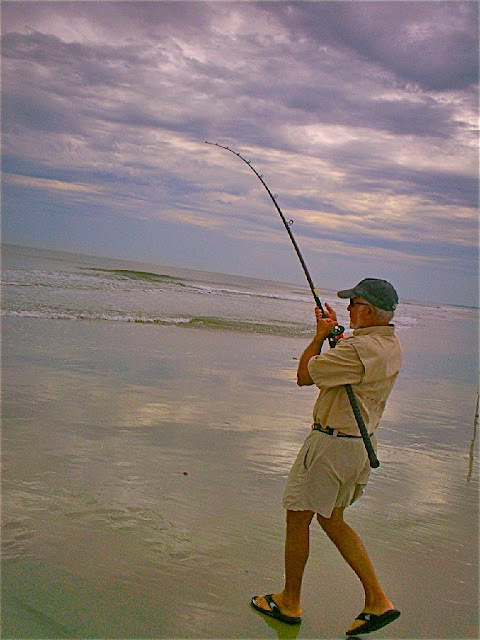 I will be covering some new topics like natural bait preparation, reading the beach and water color, spend a little more time on distance casting techniques , and will go over some of our local beaches that have changed the trough areas due to previous storms and sand shifting. Tackle, techniques, current hot spots, and a few other species will all be covered also. The Pompano Seminar is the most popular one that I do all year and I hope to see you there. The big news inshore this week was a nice push of pompano into the Loxahatchee River (and a few into the ICW up north as well). 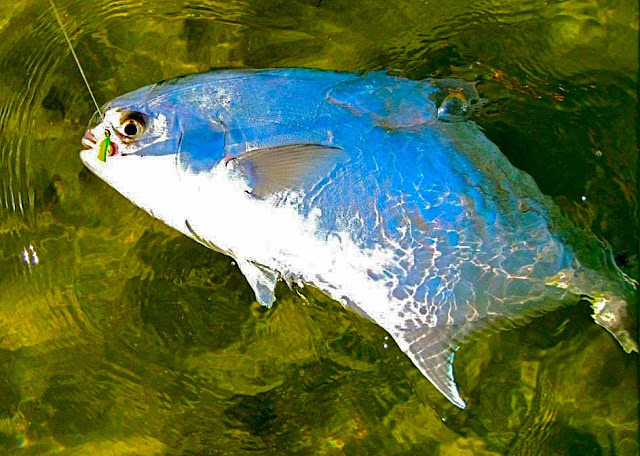 The pompano are biting sandfleas, shrimp, and Doc's Goofy jigs the best. Sounds like the traditional river jig colors (orange, pink, yellow) are working best for the pompano; with 3/8oz being the top size. Look for the pompano to "skip up" behind the boat while running, and set up in that area for best results. The black drum and sheepshead continue to bite fairly well around boat docks and seawalls in the ICW, especially those with acess to some deeper water close by. Snook fishing has been a bit slower this week. A handful of tarpon reports starting to trickle in from Palm Beach Inlet. SURF/PIER- Very tough week along the beach and at the pier this week overall. The Juno Beach Pier has had a small handful of Spanish Mackerel around, but for the most part they are turning down most lures in favor of bait (sardines). Kingfish action slowed as well at the pier this week, with just a few being picked off on trolley rigs. A handful of pompano are being caught north of Jupiter Inlet, but overall slower pompano fishing this week. Bluefish were biting cut bait at Hobe Sound Beach earlier in the week, but large swell later in the week slowed that down as well. Just kind of a tough week overall along the beach. Fishing in the Indian River has still been good, with plenty of Redfish around, and some larger Seatrout. Both species have been taken on Hook Up Jigs, DOA CAL jigs, and Gulp Shrimp. Fly anglers have been scoring on crab patterns for Redfish, and Clouser Minnows and Seaducers for the Seatrout. There have also been Pompano caught intermittently on jigs. 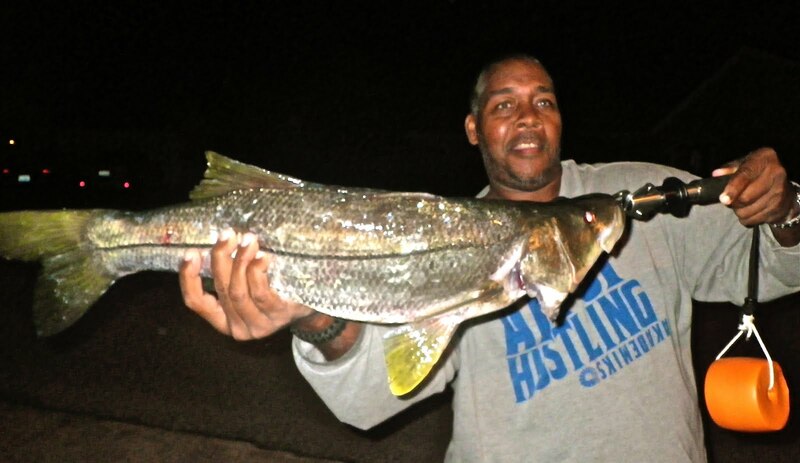 Fishing the inlets for Snook has been good as well, but closed season lasts a few more weeks. In the surf, fishing for Pompano has been good on sand fleas and clams, and there’s still plenty of Bluefish around taking spoons. There’s still a decent pompano bite along the beaches in Martin and St. Lucie Counties. In the St. Lucie River best bets are working the docks, bridge pilings and channel edges for black drum, redfish and sheepshead. With the west winds lately the west side of the river along Indian River Drive has been a good option. Along the beaches, up to Hobe Sound, there have been good numbers of pompano, bluefish and Spanish mackerel. In the Loxahatchee River, bluefish, ladyfish, jack crevalle, a few pompano and even a few flounder are being caught along the docks, bridge pilings and channel edges. Surf fisherman working the beaches between Boynton Inlet and the Lake Worth Pier said the action has been slow the past week. They’ve been catching some small whiting on cut shrimp and a few jack crevalle hitting surface plugs and poppers in the early morning. 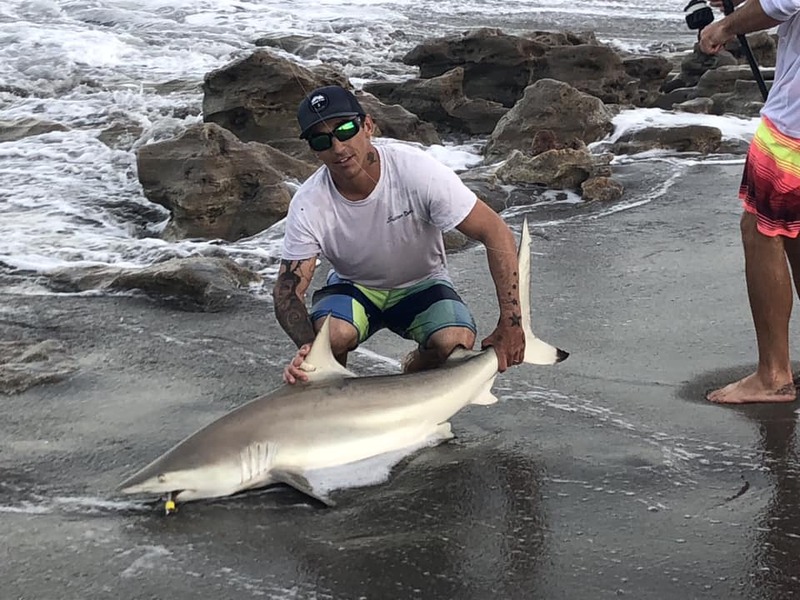 Anglers fishing the north jetty at the Boynton Inlet reported catching mangrove, dog and schoolmaster snapper using live shrimp and small live sand perch for bait. Also, sheepshead up to eight pounds have been taken using live crabs during incoming tide along the inside of the north jetty. Fishing live shrimp on eighth-ounce jig heads and casting root beer grub tails on quarter-ounce Cotee jigs has been producing spotted sea trout, mangrove snapper, snook and a few redfish for anglers working the docks around Ocean Ridge, Hypoluxo Island and Manalapan. There were some small blacktip sharks caught by anglers fishing large chunks of mullet around the Lantana Bridge. 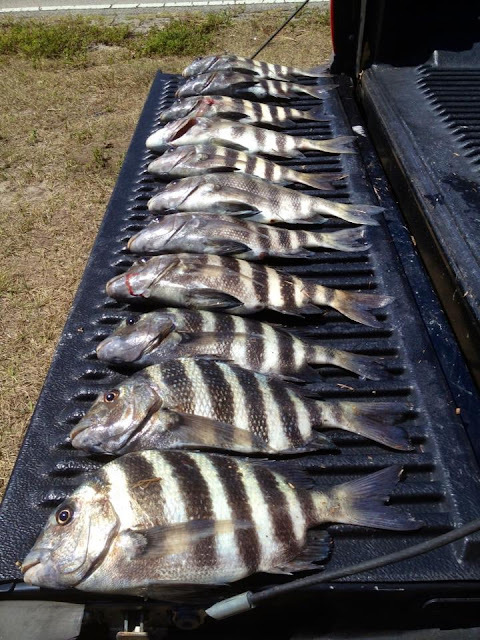 Also sheepshead and large pinfish have been hitting shrimp and clam strips. Despite the cooler weather the bass fishing has been good using live shiners. If going with an artificial, however, Senkos and small creature baits have been effective. Top spots have been the J&S Canal/Henry Creek area and King’s Bar. Though still not red hot, the spec bite has started to pick up. 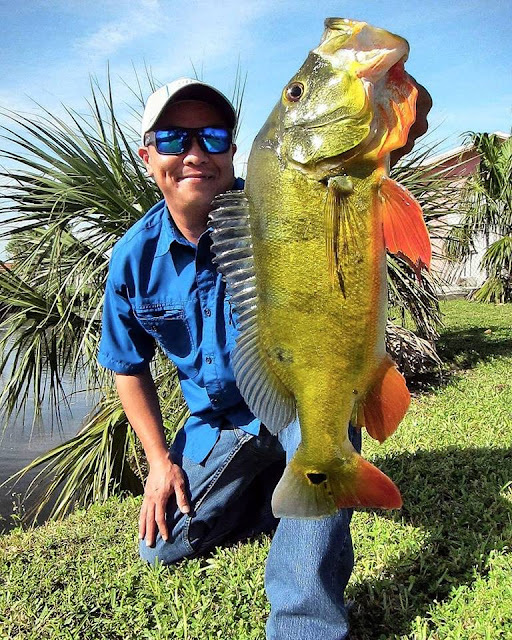 Anglers using minnows and working the Indian Prairie Canal and the Kissimmee River in depths of 8 to 14 feet are having the best luck. Working the canal system along the Turnpike, 441 and the Arthur Marshall Conservation Area, anglers are catching largemouth and peacock bass and some pickerel. In Lake Osbourne they are also catching largemouth and peacock bass as well as sunshine bass, black crappie and clown knifefish. Fishing live bait including shad, shiners and minnows around lilly pads, thick weed edges and bridges is a best bet. I'm sorry to say that the surf bite this weekend did not keep pace with the epic sailfish numbers that were recorded in the Pelican Billfish Tournament. There were close to a 1,000 sailfish released during the tournament, with over 700 on Thursday alone. I recommend you go online and read the articles Ed Killer wrote during the week about this incredible fishing. As far as our surf action is concerned, pompano, whiting, croaker, and jacks were all on the catch list. The fish are spread out and there does not seem to be any one area or location that is producing large numbers of fish. I went from Blue Heron up to Round Island and managed to put together a decent catch of pompano on Saturday. EZ Flea Fishbites and clam strips were the preferred baits and the best beach action seemed to be at Round Island in Fort Pierce. My son Randy and I fished today at Blue Heron and Middle Cove beaches with Blue Heron producing most of the pompano. The best action seemed to happen between dawn to 9 am, and EZ Flea and Pink Shrimp were scents that produced today. The whiting, as usual, preferred the Orange Clam scent. We are forecast to get some northwest wind tomorrow and that should help get rid of some of the weeds that have made some beaches difficult to fish recently. The Round Island area did not produce today so hopefully some of those fish will make their way south into our immediate area. I also wanted to let everyone know that the Surf Fishing for Pompano Seminar I will be presenting at Bass Pro Shops in Port St Lucie next Saturday, January 19th will be at 3:30 PM in front of the Aquarium, so if you get a chance, stop on by. Fishing has been TREMENDOUS..and the weather has been gorgeous, plan a visit to the inlet this week! Brand new fishing report this morning from our friend Tommy at Sebastian Inlet Bait & Tackle: lots of Snook, Reds, Flounder, Black Drum, Sheepshead, Spanish Mackerel and Bluefish. Anglers are mostly using live shrimp for the Flounder and sand fleas for Drum and Sheepshead. Larger live shrimp for the Snook and Reds. 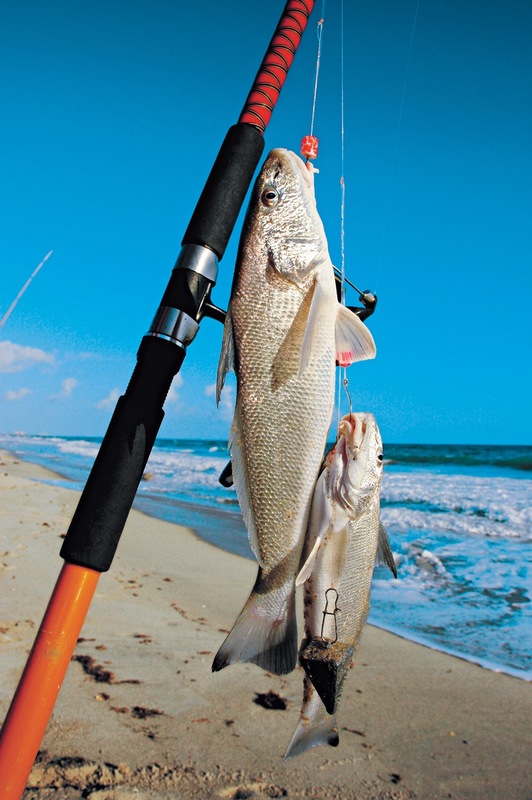 Try for Snook, Reds, Spanish Mackerel, Bluefish and Drum off the North and South Jetties. 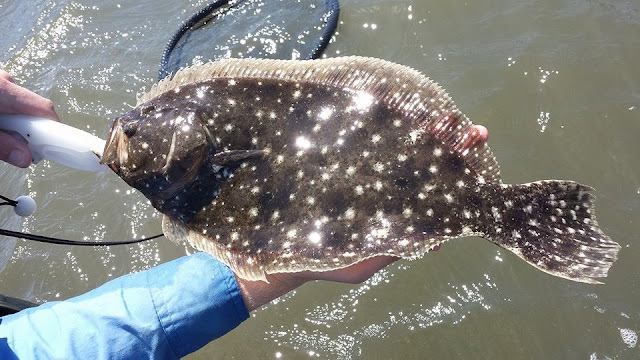 Your best bet for Flounder and Sheepshead is West of the inlet. A big thanks for our featured anglers of the week – Tiffany Kelley and Felipe Gonzalez of Ocoee – for sending in their pics. Regulars at on the North Jetty who spend almost every weekend there, they recently caught these beautiful Reds. 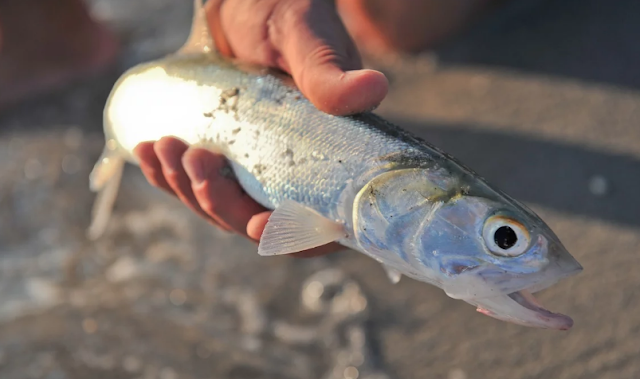 Earlier in the week, before the harsh weather hit, anglers surfcasting along the beaches a half-mile north of Boynton Inlet reported catching pompano, bluefish and whiting. The bluefish were hitting top-water poppers early in the morning and the pompano and whiting were hitting live sand fleas and cut shrimp on pompano rigs. Pompano were also being caught in the Intracoastal Waterway and the flats on the north and south end of Manalapan. White or yellow pompano jigs bounced off the bottom produced the most bites. The fish have been feeding on the flats during high tide, then moving along the channel edges during low tide. Redfish, small Jacks and a few flounder up to 6 pounds were taken off Lantana bridge on Sunday. The Redfish were hitting cut mullet and small live pinfish fished near the bridge fenders. The flounder are eating live shrimp fished on the bottom near the rock piles and close to the south seawall. Anglers fishing Lake Osbourne and the adjoining canals recently have caught peacock bass on top water Chug Bugs in frog colors during the day and sunshine bass, clown knifefish and black crappie using live shad and Missouri minnows at night. They’ve also caught channel catfish up to 12 pounds using cut shad fished on the bottom. The holidays are over and 2019 is upon us already. Winter arrived a little early this year and the cold fronts have cooled the water down quite a bit already. January is traditionally a cold month for the Treasure Coast and the weekly fronts will bring a few days of cooling things down for us to deal with. Wearing layers is essential to cope with the temperature swings that can be as much as 40 degrees or more. Plan your fishing according to the weather forecasts and enjoy the fishing. Lots of species are in the river this month. Pompano, sheepshead, drum and Spanish mackerel are all winter fish that arrive here as the water temps drop. It’s an awesome time of year! Fishing channel edges can find these fish lurking for an easy meal. I like jigs in these places for our best results. Bridges and docks will also be great places to target drum, sheepshead and redfish. Try a DOA shrimp or live bait when fishing these areas. Don’t forget mangroves for redfish and snook as well. Spanish mackerel will generally come in with the tides and can be found around the inlet areas. Small shiny lures work best on them. Water temperatures can determine where you fish and how your fish. Winds will give you another factor to adjust to. As temps drop, move to deeper water areas for your best opportunities for catching fish. Channel edges are particularly productive in winter. Fish the grass flats for redfish and trout as the sun gets higher in the mornings. DOA Deadly Combos are excellent tools for searching out trout and reds. January is typically a windy month and it will continue the tradition if recent weather gives you an insight to the coming month. You might enjoy one or two days a week that is calmer but expect it to be windy most days. Using the right ramps can make your day a little easier in dealing with the weather. There are many ramps around the area that allow you to launch depending on wind direction. The river can be rough some days, but you can still fish most days if you plan your trips carefully. It is a great month to fish despite weather conditions that might not be to your liking. 2018 was an outstanding year for us and I expect this year to be even better! 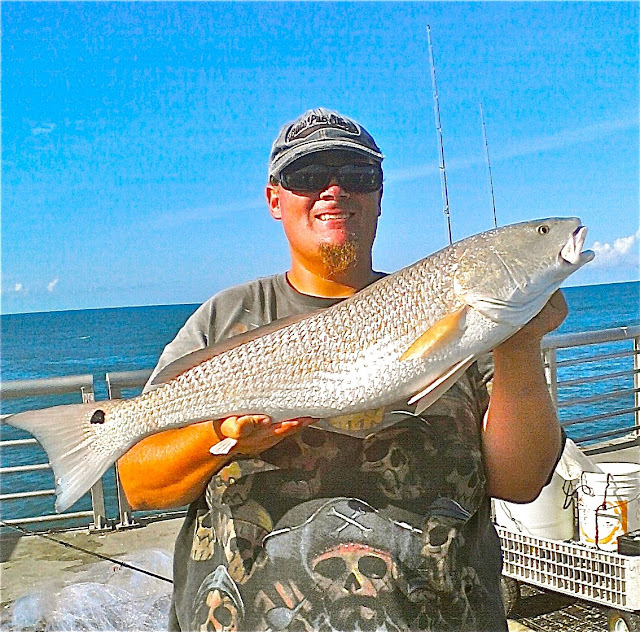 The warm and relatively calm conditions have lead to some pretty good fishing in the Indian River, with pretty fair numbers of Redfish being caught along the shorelines. Gulp Shrimp, DOA CAL jigs, and flies such as the Shrimp Tease have accounted for most of the catches. Sea Trout have also been active along drop offs and shorelines with depth, falling for a variety of baits, including DOA Shrimp, Mirrolure Mirrodines, Yo-Zuri slow sinking twitchbaits, and even some topwater plugs like the Rapala Skitterwalk. Pompano fishing in the surf has been good during the calmer days, mostly on sand fleas, and Bluefish have been taking spoons fairly regularly. Sebastian Inlet has produced pretty fair Flounder catches on live Finger Mullet, and Fort Pierce Inlet is still the place to be to try and boat a Tarpon at night using bait or plugs.